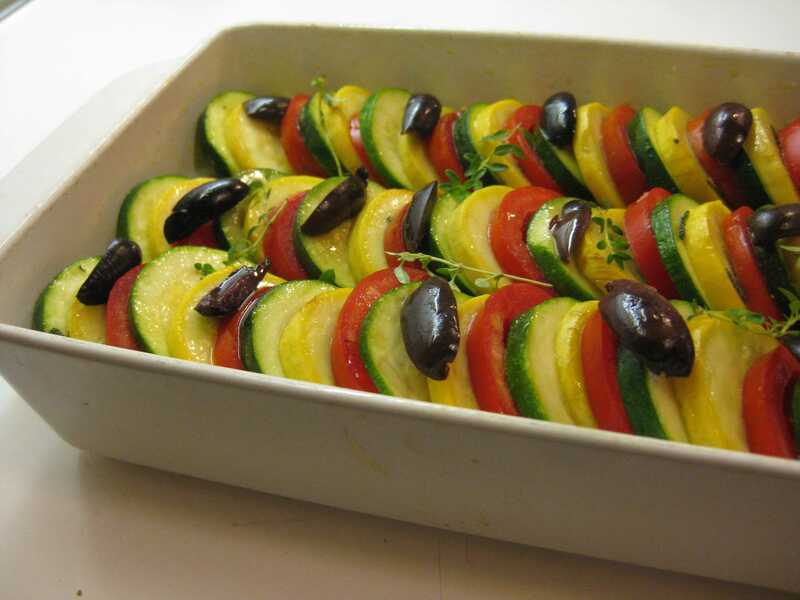 A tian is basically a layering of vegetables whose juices meld together while baking. The word comes from the name of the vessel that traditionally held the vegetables (like the tagine of Moroccan cuisine). This is in contrast to a gratin, a word that comes from the French term for scrape. Perfect, since its characteristic is a topping of grated cheese and/or stale bread. This dish would be a gratin if topped with cheese or bread, and it would be delicious prepared that way. Like most composed dishes, this requires some advance planning, but is equally fine tossed together as a jumble. I have frequently made this for parties and picnics since it can be assembled in advance and cooked at the last minute. It can be served hot or at room temperature. And the leftovers are even more delectable, a great base for a poached egg for a simple lunch or supper (or in my case, a savory breakfast). The complexity of the dish is not just visual. 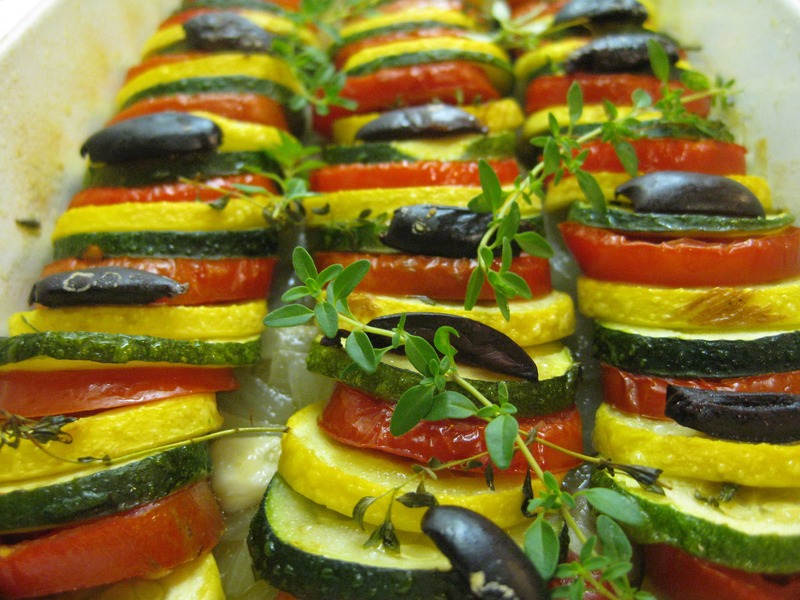 It comes in part from the layering of vegetables whose juices meld during cooking. But the real source is the advance sauté of the onions and squash with a mixture of herbs. 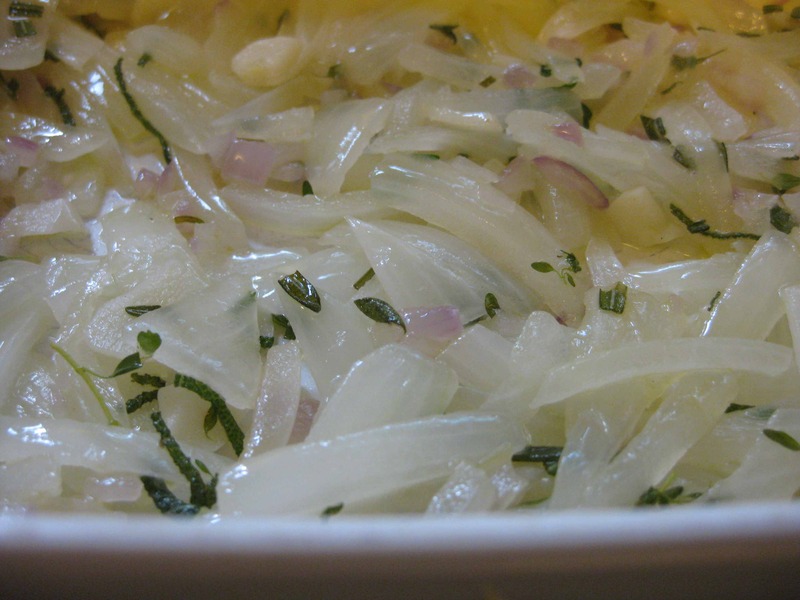 First, sliced onions are lightly cooked in olive oil and chopped sage, rosemary and thyme. (I like to halve the onion crosswise and lengthwise, then slice it lengthwise into half moons, or quarter it and slice it crosswise.) The onions are then placed in the bottom of a baking dish. I used an enameled cast iron but a terra cotta or ceramic dish is probably more traditional. Then squash slices are lightly sauteed the same way, until slightly brown but not mushy. This is essential to the character of the dish. You can layer them the way I did or simply toss them on top of the onions, tucking slices of tomato here and there and topping with olives. I add a few sprigs of thyme on top before baking and a few more as garnish. The method came from Deborah Madison’s superb vegetable cookbook, The Savory Way. This is one of my favorite cookbooks not only because of the inspired cookery but also because of the graphic design. Good paper, nicely bound, well composed, decorated throughout with woodcuts. It’s a real pleasure to use. 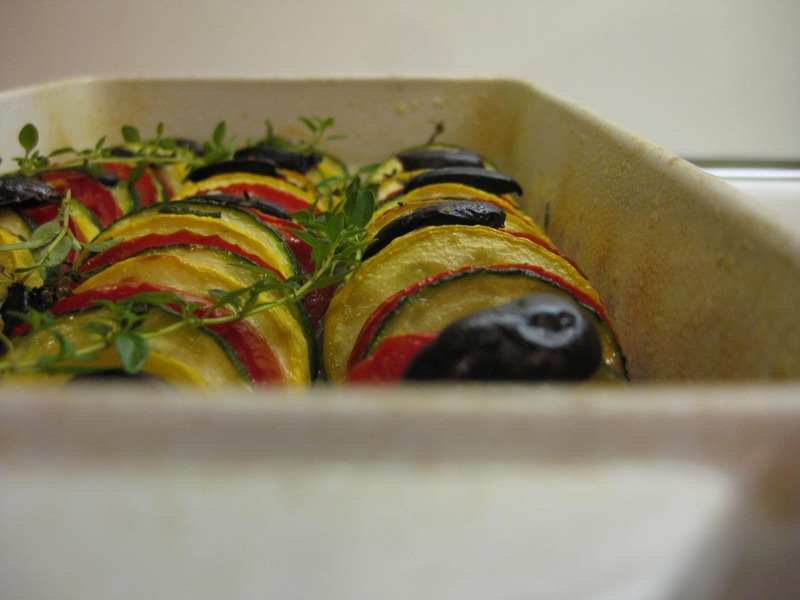 Adjust the quantities according to the size of your baking dish. The amount of vegetables below will fill baking dishes of approximately 7×11 inches or 8×12 inches. Prepare the vegetables. Slice the squash into ¼-inch thick rounds. Slice the tomatoes into the same size pieces. Quarter the onion and slice it vertically into half moons. Chop or slice the garlic. Divide the herbs into two parts. In a large sauté pan, heat 2 tbsp of the olive oil and add the onions, the garlic, half the herbs and a little salt. Cook slowly until the onions have wilted but don’t brown them. Place the mixture in the baking dish. Bake, covered with foil, for about 50 minutes. Remove the foil and let cool for at least 10 minutes before serving. Garnish with fresh thyme.